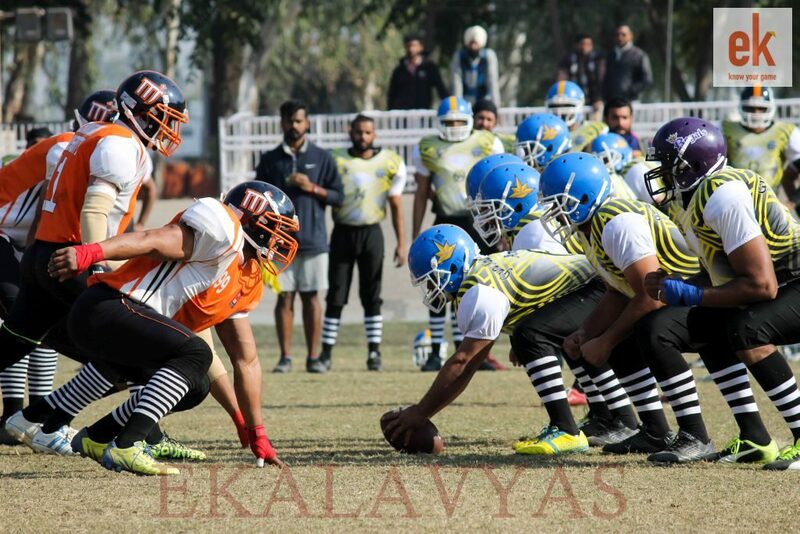 Patiala, 24th December 2015: The 2nd American Tackle Football All India Inter University Championship at Punjabi University, under the aegis of Elite Football League of India University (EFLIU) and Association of Indian Universities (AIU), witnessed some decisive action on Day two. The 3rd match (and the 2nd quarter final) of the day was a clash of the giants with defending champions Guru Nanak Dev University (GNDU) facing off against this year’s favourites Chandigarh University (CU). The match was expected to be close and exciting. Both teams kicked off with high energy defense and were neck and neck in the first quarter. In the 2nd quarter, CU finally broke through and scored the first touchdown of the game. They also secured 2 points off of safety. Defense prevailed for the rest of the game with neither team getting near each other’s halves and it seemed like CU would come away with a win. GNDU almost made the match interesting with a strong push in the dying moments of the game but were denied by the CU’s linemen only 5 yards short of the endzone. CU now moves forward into the semifinals and are strong favourites to win it all. The last quarter final of the day was between Bangalore University (BU) and Osmania University, Hyderabad (OU). From the get go, Osmania University’s team seemed in control with stifling defense and clinical offense. Bangalore University’s team looked out of their comfort zone and their offensive linemen were not able to contain OU’s linebackers who tackled BU’s quarterback on multiple occasions. Osmania University scored their first touchdown at the end of the 2nd quarter and their celebration was a sight to behold. Bangalore University did get close on a few occasions but OU’s defense prevailed and denied every opportunity to reach the endzone. Osmania University now moves into the semifinals where they will face the home team, Punjabi University. Day 2 of the 2nd American Tackle Football All India Inter University Championship started with the exciting matchup between Bangalore University (BU) and Poornima University, Jaipur (PU). Having already won their first match, Bangalore University had the momentum on their side. BU’s team kicked off, but in a rare event recovered the ball immediately to gain possession. 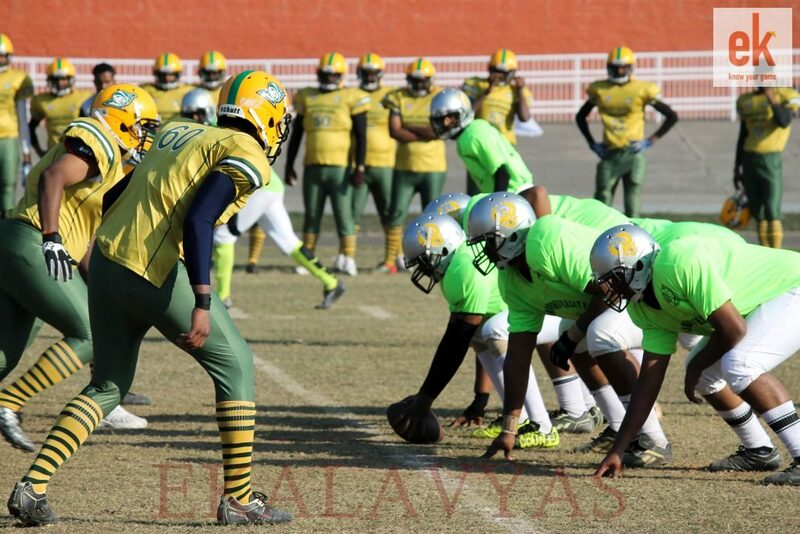 The teams looked evenly matched in the early going but Bangalore University broke the game open with a 50 yard touchdown off a punt kick by Poornima University. It was smooth sailing for team BU from that point onwards since the offensive linemen of PU looked overmatched against the defensive brilliance of BU. BU scored a total of 2 touchdowns which could have been extended to 3 if not for a premature celebration by their running back Frank. Even though Poornima University scored a touchdown in the 4th quarter, the game never really looked close despite what the score indicated. 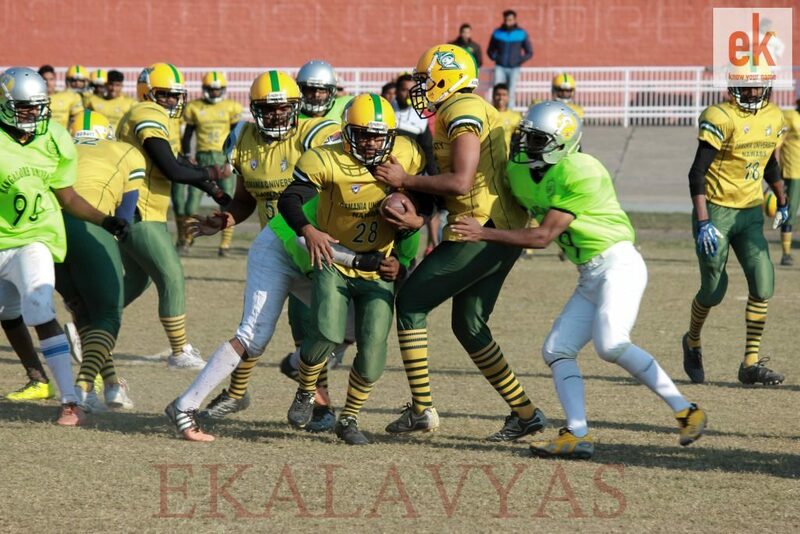 The 1st quarter final of the tournament featured MD University, Rohtak (MDU) vs. JECRC University, Jaipur. MDU stunned their opponent by starting off with a brilliant 30 yard pass by their quarterback which was capped off by a great catch leading to a 50 yard touchdown on the opening play. MDU was playing like an offensive juggernaut, making accurate passes and easily gaining yards while JECRC seemed out of their depth both defensively and offensively. MDU seemed in control for the first 3 quarters jumping to a 2 touchdown lead. It was in the 4th quarter however, that things got exciting. JECRC started playing with a sense of urgency and renewed energy.This led to an incredible 50 yard touchdown to start the quarter. Just when it started seeming like a comeback was on the cards, MDU put all such thoughts to rest with another touchdown capped off by a brilliant play –a fake field goal attempt and a 2 point conversion, which put the nail in the coffin. The tournament is being held over 4 days and has a direct knockout structure i.e. winning teams advance to the next round and losing teams get eliminated. This is the 2ndEdition of the tournament and has been organized by the Directorate of Sports, Punjabi University; under the aegis of Elite Football League of India University (EFLIU) andAssociation of Indian Universities(AIU). The tournament is being played on grounds specially designed for American Football, complete with line-marking and goal posts. Unlike the inaugural edition, which witnessed both flag football and tackle football, in this second edition only Tackle football will be played in full American Football protective gear.